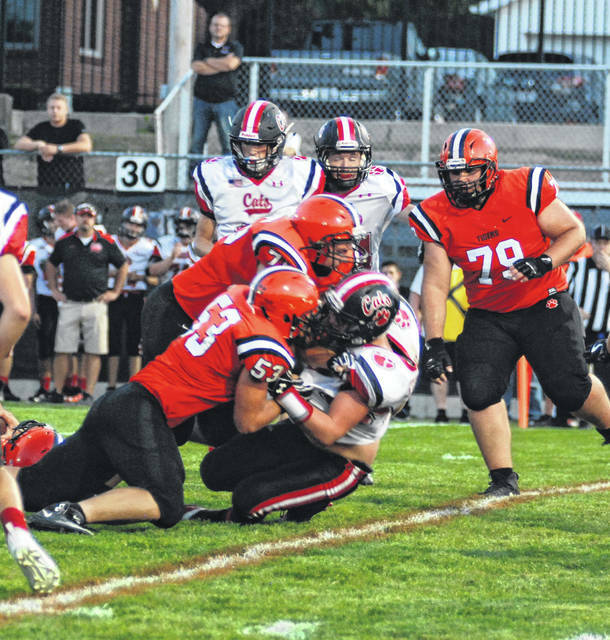 Ben Albers (53) and a Versailles teammate tackle a Delphos Jefferson runner on Friday night. The Tigers won their first game of the season, 47-14. Derek Cavin (42) breaks free for a long run against Delphos Jefferson on Friday night. The Tigers won their first game of the season, 47-14. 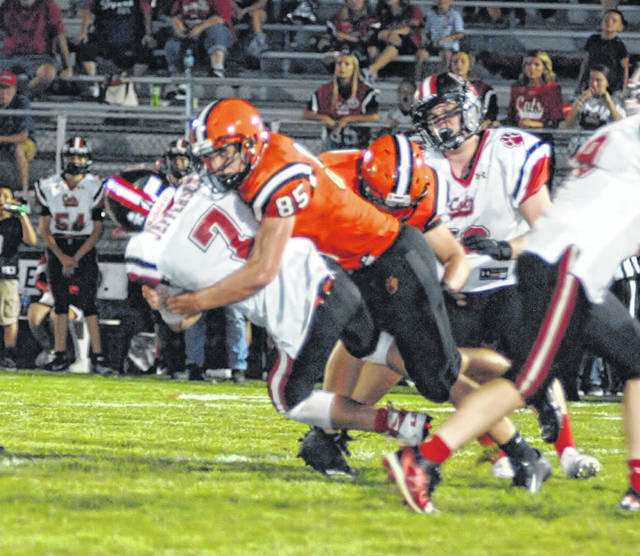 Evan Hiestand (85) gets one of his three sacks on the Delphos Jefferson quarterback on Friday night. The Tigers won their first game of the season, 47-14. 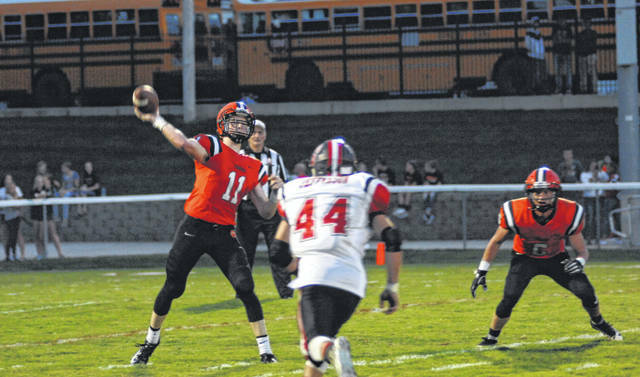 Ryan Martin (11) throws a pass with a Delphos Jefferson defender chasing him down on Friday night. The Tigers won their first game of the season, 47-14. 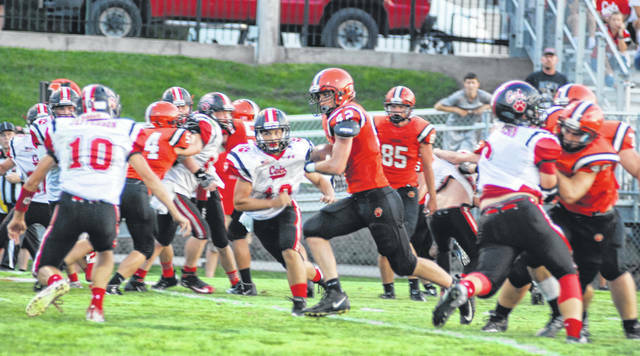 VERSAILLES – The Versailles football team found a reversal of fortunes Friday night against Delphos Jefferson. Coming off a stinging 42-12 defeat at Celina, the Tigers routed Delphos Jefferson 47-14 to improve to 1-1 on the season. The defense set the tone on the first series with three straight negative yardage plays, the third being a sack by Evan Hiestand, his first of three on the night. Derek Cavin started the scoring for the Tigers on a 25-yard run with 8:56 left in the first quarter. The drive was aided by a pass interference penalty and an unsportsmanlike call against the Wildcats. Cavin also had a sack and teamed with Hiestand at the defensive ends spots to harass the Jefferson quarterbacks all night. The Tigers scored two more times in the first quarter. The first was on a quarterback keeper by Ryan Martin from 2 yards out, the extra point was missed. The score was set up by a 12-yard pass to Michael Stammen to the four. The Tigers closed out the first quarter scoring with a 1-yard run by Jacob Poling. The score was 20-0 with the extra point. The score was set up by runs by Poling and Cavin and a pass to Hiestand. The Wildcats had a chance to get some momentum after a muffed punt at the Tiger 32-yard line, but the Tiger defense stepped up and pushed the Wildcats backward. The Tigers held on fourth down with an incomplete pass from the 41-yard line. The Tigers drove down the field scoring on a 13-yard pass to Stammen with 3:37 left in the half. The extra point was missed, but the Tigers had a commanding 26-0 lead. The Tiger defense set up their last score of the first half. Hiestand got a strip sack and Chase Detrick recovered the fumble at the Jefferson 20-yard line. Poling scored from seven yards out making it 33-0. The Wildcats scored with 59 seconds left in the half. A 67-yard touchdown pass put the Wildcats on the board. The extra point was missed and the teams went in at the half with the Tigers up 33-6. The Tigers received the second half kickoff and wasted no time scoring. With only 1:09 off the clock, the Tigers scored on a 2-yard run by Jack Barga. With a running clock, the Tigers started subbing in players. The Tigers scored in the fourth quarter on a Hunter Trump 17-yard run. Jefferson scored late in the game to make it 47-14. With two minutes left, the game was called due to lightning. The Tigers will host 2-0 Coldwater next Friday night. The Cavaliers have beaten Kenton and Clinton-Massie this year. This entry was tagged Adam Miller, Delphos Jefferson, Evan Hiestand, MAC, Ryan Martin, Versailles Tigers. Bookmark the permalink.